CDSB is an international consortium of business and environmental organizations formed at the World Economic Forum’s annual meeting in 2007. CDSB’s members are committed to the integration of climate change and environmental information into mainstream corporate reporting. CDSB advances its mission through development of an international reporting framework for use by companies when making certain disclosures in, or linked to, their mainstream financial reports. The Framework is designed to elicit information that can be built into investor analyses of financial and environmental risk related to climate change. Development of the Framework and CDSB’s other work is a response to the general demand for a global reporting model that provides markets with the full range of information they need in order to determine corporate performance. CDSB also responds to the more specific demand for more standardized reporting requirements and practices. The outcome CDSB seeks is that, through adoption of its Framework, more reliable information will reach businesses, investors and regulators in support of the decisions they must make and the actions they must progress in response to climate change and other environmental challenges. 2. What is the CDSB Framework for? The CDSB Framework sets out an approach to reporting environmental information in mainstream reports. 3. What is in the CDSB Framework? The guiding principles are designed to ensure that environmental information in mainstream reports is useful to investors, is correct and complete and is based on criteria that are suitable for conducting assurance activities. The guiding principles are to be applied in determining, preparing and presenting all disclosures made in accordance with the reporting requirements. The CDSB Framework sets out a number of reporting requirements. The requirements tell an organization what and how to report in terms of environmental information in mainstream reports. The requirements draw on existing frameworks, standards, laws etc. and on CDSB's input where there are gaps in existing provisions. The guidance includes background information and points to sources of information that may be used to help comply with the reporting requirements. 4. What is a mainstream report/mainstream reporting channel? A mainstream report is the annual package of information that certain organizations are required to produce by law. Typically the information is for the company’s shareholders and the package of information comprises various elements including financial statements, management commentary, and corporate governance statements. Mainstream reports are normally publicly available. Requirements to deliver mainstream reports and the way in which those reports are referred to vary globally. In some countries the mainstream report is called the Annual Report. As the requirements of mainstream reporting develop and expand, for example, to include information about gender diversity and remuneration practices, some regulators are considering the role of corporate websites as a mainstream reporting channel, provided that material disclosures are reported in the mainstream report. The CDSB Framework helps organizations to navigate through the most common elements of mainstream reports (that is management commentary, governance disclosures and financial reports) in order to incorporate environmental information and encourage connections to be made between the various building blocks of reporting into which environmental information must fit if it is to be connected with corporate strategy. 5. What problem is CDSB seeking to solve? Information deficit lies at the heart of market failure to take account of risk factors that threaten economic and social stability. These factors have been implicated in the financial crisis and, for the purposes of financial information, are being remedied through the work of the Financial Stability Board, which aims to co-ordinate international standard setting in the interests of more effective financial sector policy. Similarly, CDSB’s mission is focused on developing climate change and environmental reporting standards for the provision of information to capital markets about risks posed by climate change and natural capital degradation. Although the quality, quantity and relevance of environmental information is improving all the time, the absence of structure and standardization of information together with undeveloped definitions of reporting language and characterization of performance means that risks posed by climate change and natural capital degradation are not always evident to decision-makers.. Those risks expose companies and capital markets to poor performance and therefore threaten economic and social stability. However, the risks are inherently unobserved, because they are not adequately reported in mainstream corporate reports. The Framework therefore sets out an approach to organizational mainstream reporting of environmental information that is designed to allow investors to assess the way in which the environment affects and is affected by the organization’s strategy, performance and prospects. The Framework seeks to equate stocks and flows of environmental goods and services with stocks and flows of financial assets, goods and services as being essential for an understanding of corporate performance. However, the equivalency does not extend to implying that environmental resources and services are always commodifiable, exchangeable and replaceable in the same way as their financial equivalents. CDSB recognizes that the problem it seems to solve depends on limiting the use, trading and exchange of environmental goods and services. 6. What types of information are covered in the new Framework? The CDSB Framework for reporting environmental information, natural capital and associated business impacts presents clear links between its principles and reporting requirements with the TCFD recommendations and the supporting recommended disclosures. The requirements provide more detailed disclosure expectations for reporting “environmental information” in mainstream reports, with clearly outlined purposes. There is also additional guidance on risk management, as well as a recommendation for companies to consider how resilient their strategies are to material environment risks associated with a 2°C or lower scenario, in line with the Paris Agreement and all the requirements stemming from it. 7. Why has CDSB expanded the information covered by the Framework? Since the release of the expanded CDSB Framework in 2015, the international reporting landscape has evolved with a number of key announcements, including the Paris agreement (2015), the enactment of Article 173 of the Energy Transition and Green Growth Law in France (2016) and the recommendations of the Financial Stability Board’s Task Force on Climate-related Financial Disclosures (2017). The Framework has been updated to reflect the continuing changes in the landscape, with the strategic objective to help companies understand how using the CDSB Framework helps them comply with current reporting requirements, including implementing initiatives such as the TCFD recommendationsto develop more transparent and sustainable financial markets. The Framework has kept its principles and purpose from its predecessors that climate change reporting should not be separated from or given disproportionate attention compared with other areas of sustainability, such as water. Increasingly, business' use of and effect on a wide range of environmental resources and services is recognised as affecting the continuing ability of the environment to provide the resources and services on which it depends. Accordingly, CDSB's Board member organizations have been developing tools, programs and initiatives that encourage businesses to understand, monitor and report on their use and effect on environmental resources and services that affect the climate system, the environment, the economy and society. Since its inception, CDSB has worked to support and enhance its Board members’ work by referencing and incorporating their main themes and content in the Framework. All members continue to develop or support solutions to climate change, however, their work now covers complementary areas. For example, CDP has established programs for reporting on forests and water. Ceres, WBCSD and WRI all offer resources for monitoring, understanding and changing the way in which businesses use and affect water. WBCSD has a dedicated Forests Solutions Group. CDP and Ceres have initiatives focused on the contribution to climate change made by the oil and gas sector. CDSB is broadening its scope in line with those developments to reflect the reach and work of its member organizations. 8. What is environmental information? 9. What measures, indicators and metrics are available to report on environmental information? CDSB does not specify the measures, indicators and metrics to quantify and communicate sources of environmental impact. Rather, the CDSB Framework relies on measures, indicators and metrics developed by its Board members and others such as CDP, GRI, WRI, WBCSD and SASB. 10. Who is information reported for according to the CDSB Framework? Environmental information reported according to the CDSB Framework is primarily for investors. The CDSB Framework is designed to help companies report environmental information in mainstream reports and therefore the audience for information prepared according to the CDSB Framework is the same as the audience for mainstream reports. In common with the objective of financial reporting, the CDSB Framework concentrates on investors as the primary users of environmental information. Information provided with this stakeholder group in mind may satisfy the needs of some other stakeholders. Through the use of information prepared according to the Framework, CDSB hopes to extend investors’ duties of stewardship beyond financial capital to the environment. 11. Why is there a need for the CDSB Framework? Increasingly regulators are introducing legislation or guidance that requires or encourages organizations to report environmental information. Various reports and reviews show that, whilst improving, compliance with regulatory requirements and guidance to provide environmental information (or subsets thereof) varies considerably. Part of the reason for this has been attributed to the absence of a single standard. CDSB aims to support regulatory developments by offering an approach to reporting that clarifies how companies might respond to requirements to report/disclose environmental information in mainstream reports. The approach reflects shared characteristics of existing voluntary and mandatory practice on environmental reporting and helps companies to navigate through the existing mainstream reporting model with a view to determining where and how best to report/disclose environmental information. Institutional investors, who tend to have a longer investment time horizon, are increasingly showing signs of interest in ESG factors. Prompted partly by new interpretations of fiduciary duty and evidence of correlation between good ESG performance and superior financial results, investors are increasingly expressing their expectations for corporate disclosures beyond what is currently provided in financial reporting. Some forms of corporate reporting are already, or are becoming increasingly standardized, such as financial statements and governance information. Reporting environmental information is less standardized as it is a newer discipline. Uncertainty as to where and how information may be presented results in time consuming data mining by users of information. More standardized presentation of information is therefore likely to assist users in locating the information they need for decision making. The CDSB Framework seeks to equate stocks and flows of certain environmental goods and services with stocks and flows of financial assets, goods and services as being essential for an understanding of corporate performance. Performance for the purposes of the CDSB Framework therefore takes account of both financial and environmental performance. However, the equivalency does not extend to implying that environmental goods and services are always commodifiable, exchangeable and replaceable in the same way as their financial equivalents. CDSB’s mission is based on the premise that the continuance of economic, social and environmental systems depends on limiting the use, trading and exchange of environmental goods and services. 12. What is the CDSB Reporting Framework’s position on Scope 3 reporting? The CDSB Secretariat is continually asked as to why the CDSB Framework does not require measurement and reporting of Scope 3 GHG emissions in the same way as CDP’s questionnaires or the GHG Protocol. This is not because we don’t think Scope 3 is important. The most significant environmental and financial benefits may be found outside a company’s organizational boundaries in the supply chain. The reason the CDSB Framework recommends but does not require measurement of Scope 3 GHG emissions is that the objective of the Framework is to support compliance with obligations to report environmental information through mainstream reporting channels. We therefore follow the boundaries set by most mainstream reporting requirements, which, in turn are often established or influenced by financial reporting standards. In particular, mainstream reporting requirements normally apply to information relating to the entity or group of entities for which consolidated financial statements are prepared. Information relating to that entity or group of entities is often only required to the extent that the entity or activity is controlled or significantly influenced by the reporting entity/group. Where scope 3 information is reported, the CDSB Framework requires that it is distinguished from information reported for entities and activities for which consolidated financial statements are prepared. The approach to scope 3 reporting in the CDSB Framework is explained in full in our Discussion Paper and aligns with positions adopted by the IIRC and SASB. 13. Who is this Framework intended for? Report on aspects of natural capital. 14. What is the relationship between the CDSB Framework and other reporting frameworks or standards? CDSB advances its mission by acting as a forum for collaboration on how existing standards and practices can be supported and enhanced so as to link reporting of financial and environmental information. 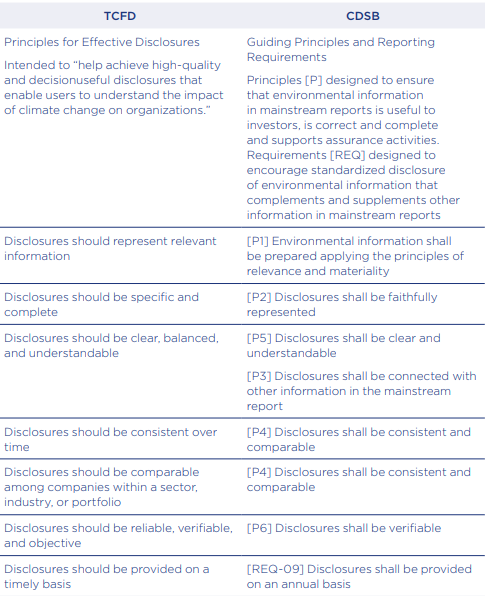 The Framework has therefore been developed to reference, enhance and complement rather than to duplicate existing corporate reporting practices that support disclosure of environmental information in or linked to mainstream reports. Additional information about how we work with other reporting frameworks or standards can be found here. 15. What are the anticipated benefits of using the CDSB Framework? The Framework’s requirements are designed to represent suitable content and criteria for conducting assurance activities. 16. How can my company indicate the use of the CDSB Framework? 1. In the mainstream report by stating that the CDSB Framework has been used for the purposes of preparing environmental information. (C12.4) Have you published information about your organization’s response to climate change and GHG emissions performance for this reporting year in places other than in your CDP response? If so, please attach the publication(s). 3: On the CDSB website: use this form to indicate your company's use of the CDSB Framework. This helps us in future developments and to use these reports as potential examples of good practice. 17. How does SASB relate to CDSB's work? The Sustainability Accounting Standards Board (SASB) develops industry-specific sustainability accounting standards suitable for disclosure in standard filings such as the Form 10-K required by the US Securities and Exchange Commission. As the missions of CDSB and SASB are aligned, we recognize close cooperation is equally beneficial to both organizations and we are, in turn, supported by and receive governance and technical input from a large number of similar organizations. The CDSB Framework cross-references SASB's standards as a recognized approach. 18. Who has developed the Framework? The Framework was developed by the Climate Disclosure Standards Board Secretariat, in conjunction with the CDSB Technical Working Group (TWG) although the Framework should not be regarded as representing the positions of any of the organizations to which TWG members are affiliated. 19. What due process is in place for the development of the Framework? CDSB has a due process that underpins its activities and articulates how the CDSB Secretariat manages revisions to the Framework. It is publicly available at www.cdsb.net/dueprocess. 20. How can I contact CDSB? CDSB’s Secretariat can be reached by emailing or calling +44 (0) 20 381 83939. 21. What is the relationship between the CDSB Framework and the TCFD recommendations? 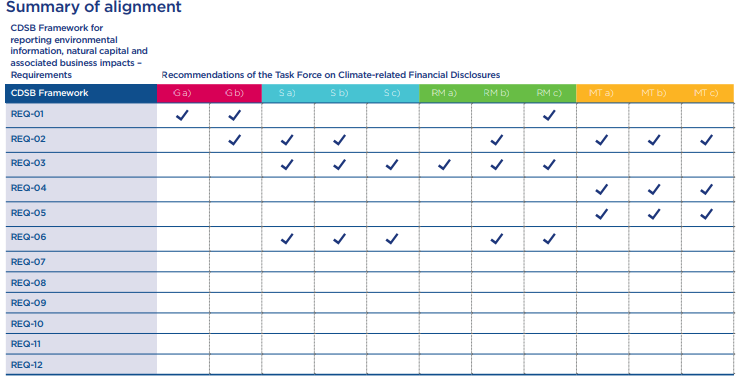 Since the publication of the previous version of the CDSB Framework in June 2015, the G20’s Financial Stability Board convened a Task Force on Climate-related Financial Disclosures (TCFD), which produced its final report in June 2017, establishing recommendations for disclosing clear, comparable and consistent information about the risks and opportunities presented by climate change. There are significant parallels between the TCFD recommendations and the updated CDSB Framework, which are highlighted throughout, so the CDSB Framework is an essential tool for companies seeking to implement the TCFD Recommendations. The CDSB Framework has a unique role in providing a harmonised set of principles along with a standardised set of requirements that closely aligns with the TCFD recommendations, illustrated below. Once organisations have identified, assessed and are managing their environmental impacts, including climate-related risks and opportunities, the CDSB Framework provides a set of disclosure requirements to translate the environmental information and associated financial impacts into the mainstream report. The CDSB Framework outlines areas of close alignment between the requirements and recommendations of the two initiatives in Chapter 3, illustrated below.